Sea Tow Services International honored individual members of the Sea Tow network for “life-saving efforts and for efforts above and beyond the call of duty” at the Sea Tow Awards Banquet on Nov. 20. The event, which also celebrated Sea Tow’s 30th anniversary, capped the organization’s 2013 Annual Meeting held in Charlotte, N.C., on November 18-21. Keynote speaker, U.S. Coast Guard Rear Admiral William “Dean” Lee, Deputy for Operations Policy and Capabilities, opened the Annual Awards Banquet by thanking Sea Tow’s U.S. Coast Guard-licensed Captains, franchise owners and support staff for their ongoing partnership with the Coast Guard in promoting boating safety and aiding maritime rescue operations across the country. 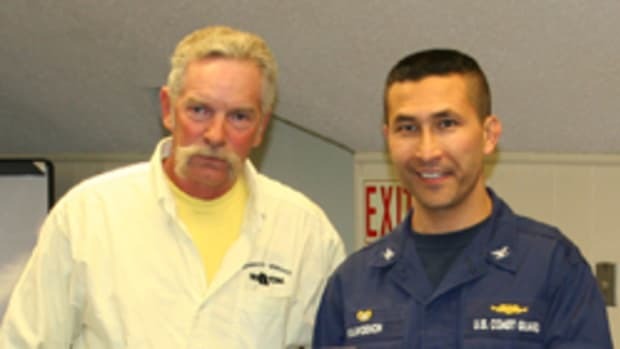 Rear Admiral Lee joined Sea Tow founder and CEO Capt. Joe Frohnhoefer and Chief Operating Officer Capt. Joseph Frohnhoefer III in presenting the following awards to Sea Tow Captains who were “local heroes” in the past year.